Hi everyone! A few days ago we announced a new brand that was added to our store, Real Techniques. This is an amazing brand of high quality make up brushes that is much loved in the blog community! Created by make-up lover and pro make up artist, Samantha Chapman, famous from YouTube channel Pixiwoo. 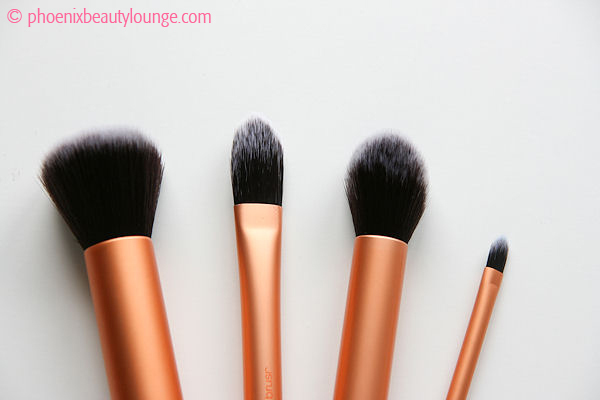 We promised you an in-depth review of the brush sets and today we’re sharing the first one! Let’s take a look at the first set we have in store for you, Real Techniques Your Base Core collection. 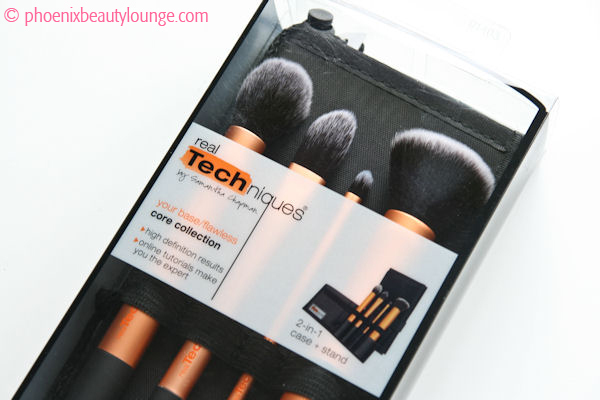 The Real Techniques Your Base Core collection comes with four brushes and a 2-in-1 brush case+stand. The case is extremely practical and is great for on-location or for when you’re traveling. Throw it in your bag to protect your brushes, and pull open the case to reveal a stand. The packaging of the brushes is very sleek. Each range has a distinct colour, the orange colour refers to the Flawless Base range of brushes. The ferrules are smooth matte aluminum and the ends have a soft matte rubberized finish. The matte finish of the handles makes these very pleasant to hold. They are lightweight and sit comfortably in your hands. 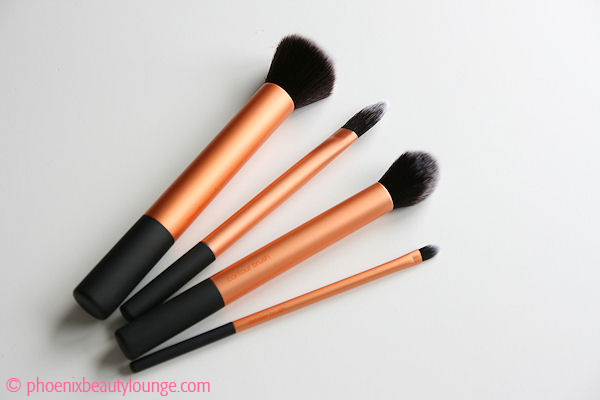 The brushes are made out of synthetic Taklon hairs which are extremely soft! The Taklon bristles are 100% cruelty free which is great. Synthetic fibres will also hold their shape much better over time. The soft fibres will help you create a super smooth finish! Let’s take a look at each of the brushes individually. This brush is large and flares out on either side. The buffing brush is perfect for, as the name suggest, buffing your foundation into your skin. You can use this with liquid, cream, even powder. It’s a great multi-tasker! This contouring brush is so soft! It’s really smooth and perfect to help you create an airbrushed finish. We love to use this for blusher, bronzer or highlighter. This pointed brush is perfect for concealer application or for lipstick. We prefer it for the latter! It’s just the right amount of stiffness for lipstick application while still being soft and giving a smooth finish. Applying lipstick with a brush will not only make your lipstick last longer but also give a nicer finish! This pointed foundation brush is perfect for liquid foundation application. It’s pointed shape will help you reach all the corners of your face, under the eyes, around the nose, etc. That concludes the break down of all 4 brushes included in the Real Techniques Your Base Core Collection set. We’ve noticed these brushes are all great multi-taskers and suited for a whole number of different types of products. These brushes cover almost all tasks to do with application of base products like foundation, blush, powder, concealer, etc. A definite must-have! You can find the Real Techniques Base Core Collection set available for purchase at Phoenix Beauty Lounge! Have you tried Real Techniques brushes or are you a fan of Pixiwoo? Let us know in the comments! This entry was posted in Make-Up and tagged make up brushes, makeup brushes, pixiwoo, real techniques, real techniques brushes, real techniques make up brushes, samantha chapman by phoenixbeautylounge. Bookmark the permalink.